Entrepreneurs often view accounting like eating broccoli – they know it’s good for them but terribly unpleasant. The goal is to power through without gagging or thinking about it too much. That is unfortunate because effective accounting is a quiet ingredient of business success. Articles on marketing and leadership steal the headlines, but rock-solid companies have a rock-solid approach to accounting, almost without exception. I recently witnessed the virtual collapse of a promising company with a beautiful product line, a dashing website, and an owner who knew how to network. The major lack was a good job costing system to show the true cost of each manufactured product. That is an extreme example. Most poor accounting decisions lead to subtle losses, not a fast disaster. They drain the enterprise slowly, which makes the leaks difficult to detect. How can you tell whether your company’s approach to accounting is working or not? To help answer that, I’ve put together a list of misguided approaches to accounting. This list is based on “in-the-trenches” experience as a CPA/finance advisor for approx. 20 privately-held companies over the past decade. It is primarily for mid-sized companies (15-20 employees on up) but could be useful for smaller companies that intend to scale. A “close” is where you formally review each line on your balance sheet and make any necessary corrections. In the end, the reviewed period is locked down, so it cannot be changed. Ideally, this is done monthly, as soon after month end as possible. Why is a month end close necessary? An income statement can only be accurate if the balance sheet is accurate. Even if you don’t understand why, latch on to this concept and don’t forget it. Most lines on an income statement happen without much thought (e.g. customer invoices automatically populate the revenue line) but generating a clean balance sheet takes manual effort and review. Without a formal close, the bottom line is never final. I’ve seen accountants go back even months later and make significant adjustments to past months. In that environment, monthly financials become meaningless because everyone knows they will change. A formal close draws attention to the monthly results. In a business that has a timely formal close, the owners look forward to the close date and the final numbers. This focus on results leads to better financial decisions and timely reaction to trends. Failing to perform a formal month end close is one of the best ways to cripple or even sink a business. If no one in the company has the time or expertise to do the close, the work can be easily outsourced. Many businesses are making this mistake and don’t even realize it. That is because incentive programs tend to evolve over time and only gradually turn into a mess. The sales manager develops customized rebate programs for various customers. One customer receives 1% back on all purchases (payable every quarter). The next customer receives a rebate (payable yearly) equal to 2% of purchases, but only on invoices paid within 20 days. The next customer earns a 3% rebate on orders above $50,000, and it is a credit on future sales, not a cash rebate. The shop supervisor implements a production bonus that is computed using a weighted average of labor efficiency, amount of rework, and the number of workplace accidents. The workers receive a monthly bonus based on this complex formula. The sales team has a wild arrangement of commission agreements. Bill receives a 2% commission on everything, Tom earns 2% only on the jobs he both quotes and sells, while Gary earns 3% only after he hits $1,000,000 in year-to-date sales. What does each one of these arrangements have in common? They are an accounting nightmare. In most cases, it is impossible to track these incentives automatically. Complex, inaccurate spreadsheets are developed to perform the calculations. Time is wasted wrangling the data, checking it for accuracy, and making changes. If these inefficient processes were happening openly on an assembly line they would be simplified almost immediately. But hidden out of sight on the computer screens of the accounting department, they go on wasting resources for years. Could a business case be made for each one of these arrangements? Yes. The better question is could a simpler streamlined arrangement achieve the same business result? Often the answer is a resounding yes! Most accounting software programs are designed with accountants in mind, not operations managers. 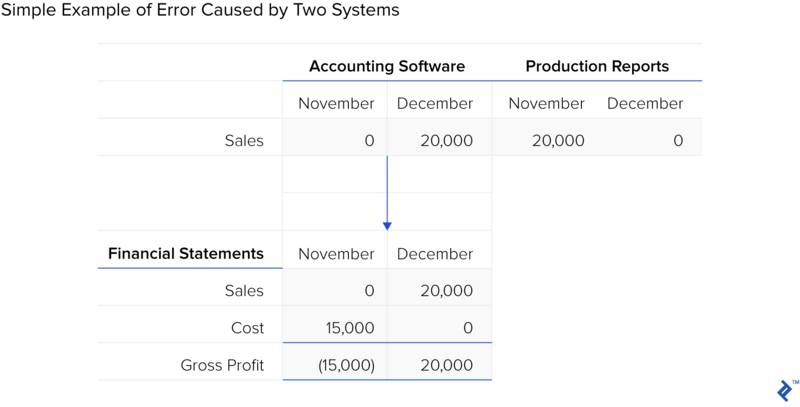 Even full-fledged six-figure ERP (Enterprise Resource Planning) systems tend to be horrible at scheduling jobs, tracking materials consumption, or following orders through a production facility. Because of these deficiencies, separate programs are sometimes used to fill the gaps. For example, the operations manager may use Microsoft Project for scheduling. The production supervisor may have an industry-specific program with beautiful dashboards that monitor job progress, as well as attendance and labor efficiency. Why is that a problem? All “real” financial activity takes place in the accounting software. Customer invoices and payments, vendor bills and payments, payroll, etc. happen on the accounting side. The financial statements flow from the accounting software. However, in the examples above, major balance sheet accounts like inventory and work in progress rely on data in these separate systems. Without a reliable tie to the accounting software, significant items can fall through the cracks. Here is a small illustration of this big problem. Let’s say a $20,000 order is completed on November 30 and shipped December 1. Based on delivery tickets, the accounting department correctly invoices the client $20,000 on December 1. To complete the November financials, the CFO asks the production supervisor for a list of jobs in the shop that were completed-but-not-shipped as of November 30. Unfortunately, the production supervisor accidentally marked the $20,000 job as “shipped” on November 30 in the separate database. The list provided to the CFO does not include this $20,000 job. The job has fallen through the cracks. November financial results will be poor because the expense for the job is in November, but the revenue is in December. The supervisor’s report would have corrected the situation but the report was inaccurate. December financials will also be incorrect because they are front-loaded with $20,000 of pure profit. This example is the tip of the iceberg. Multiple databases create the potential for error and inaccuracy in everything from labor expense to work-in-progress inventory to accounts receivable to accounts payable. 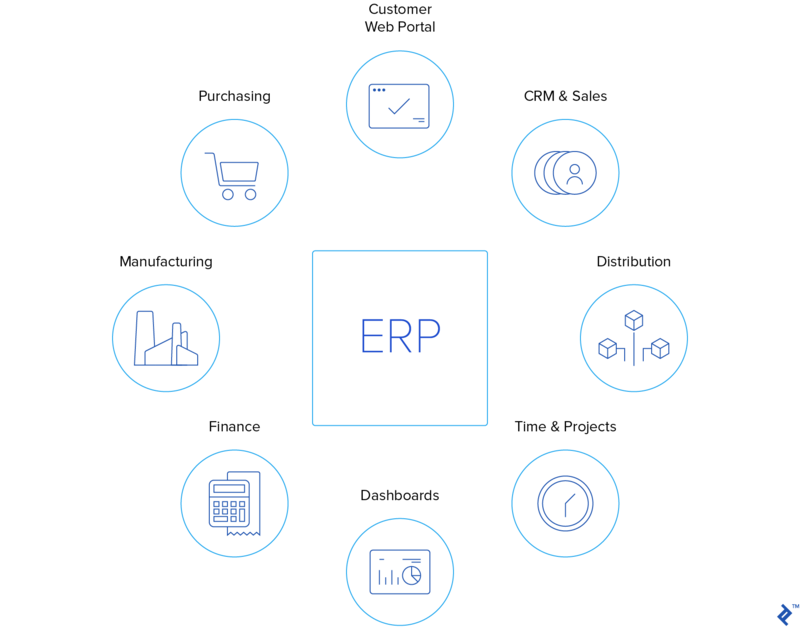 The ideal solution is a best-of-breed ERP system that meets the needs of both accounting and operations. Since that is often not possible, Plan B is extensive collaboration between accounting, operations, and IT. The mission of that group is to develop a reliable way to get accurate data from the operations software to the accounting software. The solution isn’t necessarily a data link. It could be an automated process that ensures nothing is falling through the cracks. The process should not rely on human competency. Of all the points in this article, this one may be the most difficult. It is one of the biggest threats to financial accuracy, and there is no “easy button” to make the problem go away. If you need to enter more than 5 numbers by hand, find a better way. This motto may not always be achievable, but it is a good goal. Every step in that process should be as automated as possible so the finance department can spend their time analyzing the meaningful reports. With the fintech solutions available today, data entry can be almost fully automated (e.g. through bank and credit card feeds linked to online accounting software). Even complex processes such as payroll processing and reporting can be fully automated or outsourced (e.g. Gusto payroll). IMPORTANT CAVEAT: AUTOMATION SHOULD NOT TRUMP MEANINGFUL REPORTING. Here is an example of this caveat. Let’s say there is a slick online accounting software program that can fully automate data entry but is not able to produce accurate job cost reports. Switching to such software would not be advisable if you are a job-oriented company. Even so, there are often opportunities to streamline without dramatic changes. Many accountants are perfectionists. They favor comfortable routine over experimentation. Accounting processes tend to get inefficient and manual. As a business owner, it might be insightful to sit with your accounting staff and ask if you can watch what they do. You’ll learn a lot about accounting and perhaps really help the process. Imagine you are in kindergarten (perhaps you don’t even have to pretend!) and cheerfully help them question each step. Ask what resources it would take to streamline particularly time-consuming steps. Money spent on financial analysis and planning is generally money well-spent. Money spent on inefficient data entry is simply wasted. I recently witnessed two examples of this important point. The first was the company I referenced at the beginning that almost went under for lack of a good job costing system. The other example was a successful combination manufacturing/retail company that began facing headwinds and losing money. In the past, they had gotten by profitably without a good job costing system. But when the headwinds came, they had no solid production data and ended up making a subjective decision to shut down the manufacturing side of the company. What if their feelings were incorrect and the manufacturing side was the profit center? In that case, the lack of good reporting led to a bad decision that forfeited years of potential profits. What if the plant really was losing money? In that case, good reporting would likely have closed the plant sooner and spared significant losses. Effective project costing requires more than software. Good costing procedures invariably slow production, which means top management must support the initiative. Some owners/managers claim to seek good costing, but when they see it decreasing productivity, they lose their resolve. Good management along with good software is the key. Most tier 1 and 2 ERP systems (especially industry-specific platforms) handle project costing very well. However, in the lower software tiers, project costing functionality tends to be spotty. Some widely used programs like Wave and FreshBooks do not really offer project costing at all. Other programs claim to offer it, but the functionality is weak. Running blind on project costing is an expensive mistake. A company that does not know the cost of its projects or its manufactured units is most likely a doomed enterprise. This is particularly true if the company intends to scale. I am amazed at the number of business owners who view their tax work as a commodity that must be negotiated to the lowest cost. Even business owners who recognize the value of a superior tax professional often forget to seek advice prior to making big, even huge, decisions. I am not a tax preparer, but I used to be, so I know a little about this point. It’s true there are expensive tax firms that offer little justification for their services. This is especially true for modestly profitable, cash-based, proprietor-type businesses. Any planning opportunities that exist in those cases would likely be offset by the high cost of the planning. Their tax returns are done incorrectly, and tax is either underpaid (and subject to audit and penalties) or overpaid. Their tax returns are done correctly, but legal tax planning opportunities have been ignored. Be willing to pay a premium for a tax advisor who adds value through strategy. Some entrepreneurs want this extra value but are unwilling to pay for it. That is a mistake because the extra cost can be an incredible return on investment. At a minimum, the business will have accurate tax returns that bankers, investors, or a future buyer can rely on. That alone is worth a lot. This point is probably the easiest way to directly waste the most money on accounting. I learned this the hard way in one of my first software migrations. The migration ultimately failed and resulted in a software write-off of $20,000. The all-in cost was probably double that if you add the cost of internal resources and lost opportunity. That experience is minor compared to some. There are stories of millions of dollars wasted on failed ERP implementations. I know of at least one consulting company that has a division dedicated to helping clients and software companies with failed ERP implementation lawsuits. What do these horror stories have in common? Lack of planning. You have the very best software to meet your needs. You have the right staff on board to implement it. Everyone, particularly upper-level management, fully understands and wholeheartedly supports the endeavor, and is ready to sacrifice for it. There have been months, even years of meetings and planning. These points are intended for companies implementing a tier 1 or 2 ERP system but can apply on a lesser scale even to the entry-level packages like QuickBooks, Xero, and Sage. Never, ever make a big software decision on a whim. The most successful implementation I’ve been part of involved a software selection consultant who was paid $25,000 simply to help select software and prepare the organization for an ERP system. That is more than the entire cost of the software in my failure example. However, in the end, we had working software that achieved our goals perhaps better than any implementation I’ve seen. The “how-to” steps surrounding this point are beyond the scope of this article. But let me be clear – one of the best ways to waste an incredible amount of money is to make fast software decisions and skimp on upfront investigation and planning. This point might seem juvenile, but here’s why it’s not. Most entrepreneurs understand the operations side of their business extremely well. They can quickly tell when an operations employee isn’t doing well. On the accounting side, it isn’t that easy. If you do not understand accounting, how can you tell if your controller or bookkeeper isn’t competent? On top of that, there are often several legitimate ways to approach any accounting situation. I find it common for a finance professional to be critical of another professional’s way of doing things. Often that “way of doing things” is completely acceptable, but the first professional is not open-minded enough to appreciate it. How then can an entrepreneur tell if an accountant is competent? Maximize references prior to hiring. Previous employers and previous co-workers will have a sense of competency. Bankers and tax accountants who received reports from your candidate can also serve as valuable non-biased references. Utilize a humble, highly-qualified contract CFO to review your operation as a one-time gig or for a few hours each month. Contract CFOs are exposed to multiple companies and have a good sense of what is acceptable. I emphasize the word humble. It can be very touchy to have an outside professional critique of your staff. The outsourced CFO must not be someone who feels the need to prove their own worth by finding fault. Also, the CFO must clearly be more experienced than your highest-level staff. It simply will not work to bring in an equal. The reviewing CFO must be willing to fully understand the operation before critiquing it. I’ve experienced situations where my initial reaction was disbelief at the inefficiencies and ineffectiveness of the accounting team, only to realize upon further investigation they weren’t as far off as I thought. I briefly consulted for a small construction company whose books were a complete disaster. They had hired a bookkeeping firm to do the work and apparently received a very poor member of the team. It was so bad I suggested perhaps the best option was to simply start over. The unfortunate owner had the expense of the incompetent help itself, the expense to fix the mess, and the opportunity cost of inaccurate information. Unfortunately, I’m not sure if the owner truly realized he had a significant problem. Good help will constantly leave, and significant onboarding wages will be wasted each time someone new is brought in. The people who stay will feel squashed and eventually quit trying to make things better. This point is a companion to Point 8. Part of hiring competent help is treating the accounting function with respect. When you and your accounting team are excited about minimizing data entry (see Point 4) and maximizing financial planning and data analysis, the profit center concept comes alive and staff feel empowered. Lost opportunity. In finance, almost anything that is late results in missed opportunity. For example, let’s say March financials are completed in June. March financials indicate a need to adjust pricing. Three months of selling (and unnecessary losses) have already gone by. Penalties and rework. Late filing fees and penalties are direct examples of this. But there is also a “time penalty” paid when you finalize things months after they happened. As memory fades, it becomes time-consuming to reconstruct situations from the distant past. Lost incentive to find solutions. Work that is delayed usually becomes a crisis that must be rushed to completion. In a rush situation, no one is finding solutions to problems. Instead, the goal is to get done as fast as possible. The inefficiencies continue, which causes the next round of work to be delayed and rushed again, creating a vicious cycle. No one is perfect, but well-run operations allocate resources to get things done the right way on time. Procrastinators, on the other hand, pay real money to feed their habit of procrastination. This article began by comparing accounting to broccoli – good for you, but terribly unpleasant. It doesn’t have to be that way. A company that takes the proper approach to accounting will find it can be an exciting profit center. As that becomes reality, the “good for you” part of accounting gets better, and the unpleasant part goes away. If someone can do the same for broccoli, please let me know! What does Month End Close mean? A “close” is where each line on a balance sheet is formally reviewed, and any necessary corrections made. The income statement is also reviewed and corrected as needed. In the end, the reviewed month is locked down in the accounting software, so transactions cannot be changed. A tax consultant helps companies structure their transactions to be as tax efficient as possible. A tax consultant (perhaps more commonly known as a tax advisor) is also usually responsible for preparing the company’s income tax returns. Proper accounting results in financial reports (e.g. balance sheet and income statement) that management uses to make informed decisions about the direction of the company. Without accurate financial reports, the management team is reduced to making decisions based on feelings and best guesses. Nice article ,Have you tried https://www.zaperp.com/inventory-management-software/? It is the best inventory management software which also integrates with multiple e-commerce channels like Shopify, Amazon, WooCommerce, Xero, and MailChimp.